The invasive plants program at the PMC has developed a strategic plan to address the threat of invasive weeds and agricultural pests to Alaskan agriculture and natural resources. The strategic plan was developed as a result of meetings of interested persons, and a community survey. Soil and Water Conservation Districts from across the state were involved in the review of the plan, as were the Cooperative Extension Service, state and federal agencies. These collaborative efforts resulted in a plan that addresses the goals of many concerned stakeholders in Alaska. At the core of the plan are 8 goals. Within each of goal, objectives have been identified, as well as action strategies to accomplish these tasks. Each section of the plan deals with an individual goal. The invasive weeds and agricultural pest management program is tasked with regular updates to the plan, including the accomplishments of the Division of Ag and its partners, as well as any new action strategies. Having a strategy for invasive weeds and agricultural pest management will help guide natural resource management in Alaska for years to come. The goals and objectives in the plan will serve to support organizations and to inform newcomers about invasive species and agricultural pests here in Alaska. 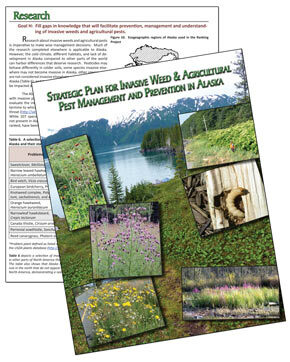 For more information about the Strategic Plan for Invasive Weed and Agricultural Pest Management in Alaska, please contact the Invasive Plant Coordinator at the Plant Materials Center, at 907-745-8721. You can download the completed plan, or individual sections, using the links below.